I cannot remember a market week with so many significant events. Important economic data and testimony by Fed Chairman Powell would be a big week. But we also have the Trump/Putin meeting, the start of an important earnings season, and the daily soap opera from Washington. I complained to Mrs. OldProf that there was no clear-cut theme for the week. She replied that since anything might happen, that was the right theme. Since then, I have had the old Cole Porter tune in my head. The punditry should prepare for a week where Anything Goes. In my last edition of WTWA I expected inflation data to attract attention. That was a very good guess, as the punditry looked for (and found) some signs of price increases. There was also continuing discussion of my prior week’s theme of reaching farther into the future to find bad news. It is encouraging to know that we are anticipating the popular topics. It does not, of course, tell us exactly what to do, but it is normally helpful for planning. This week is going to be different. The market was up 1.5%, a very nice gain. 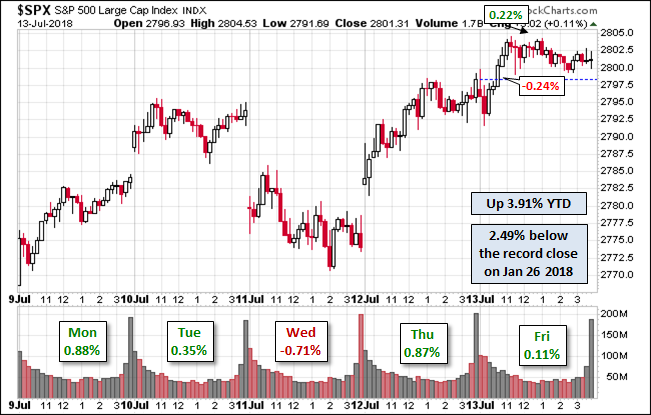 The week’s trading range was only 1.2, lower than the last few weeks and much lower than the long-term average. 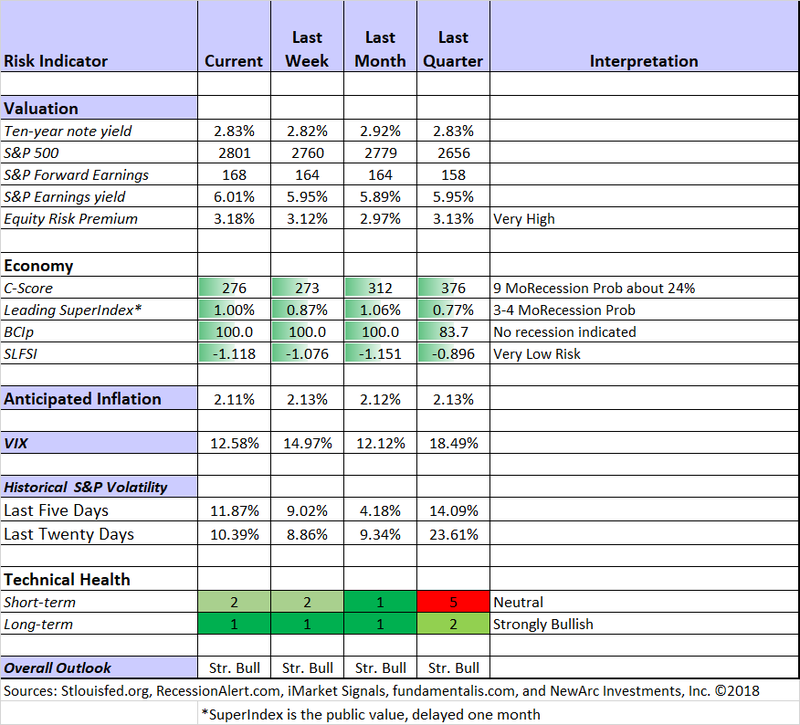 I summarize actual and implied volatility each week in our Indicator Snapshot section below. Volatility is back below the long-term range. Where to work? 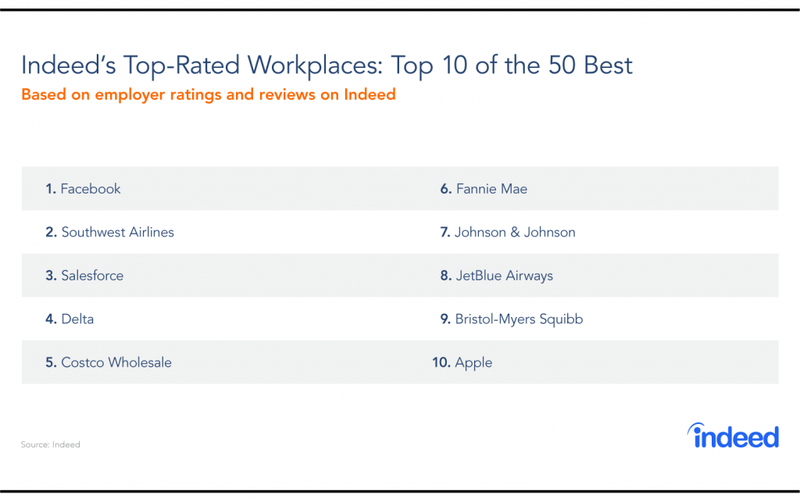 Indeed names the top 50 companies in the Fortune 500. This table shows the top ten. New Deal Democrat’s weekly summary of high-frequency data is a big help for those of us interested in plenty of facts and differing time frames. This week he notes a continued deterioration in the long-term forecast, which he has downgraded to neutral. He notes the elements which could send the longer-term forecast into negative territory: mostly M1 and the yield curve. Current and short-term indicators remain very positive. CPI increased only 0.1% overall and 0.2% on the core components, equaling the prior and expected for the core indicator. Jill Mislinski regularly updates an “X-Ray View” of inflation components. The official data is based upon a basket reflecting urban consumers. This table helps you to consider the differences from your personal basket. Initial jobless claims dropped to 214K (E 225K P 232K). Bespoke notes that while 5K above the cycle low, it is the 175th straight week below 300K. Their chart helps us see why that is meaningful. Consumer credit increased to $24.5B (E $12.4 P $10.3 upwardly revised. While some would not call a debt increase “good news” these data (for May) suggests a strong Q2 GDP. Hotel occupancy decreased. 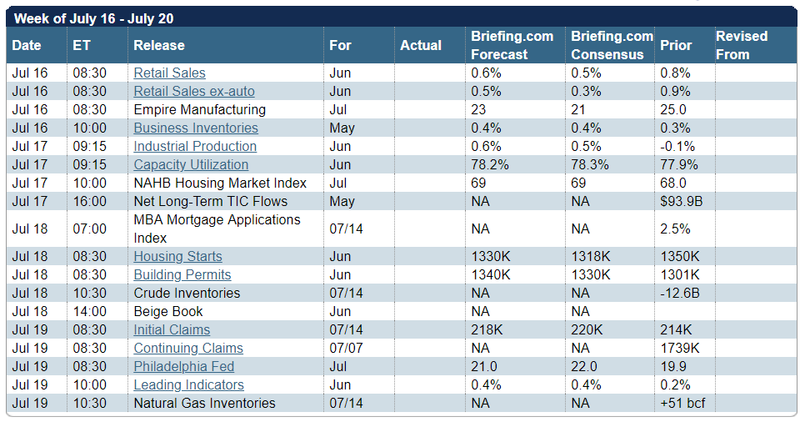 Calculated Risk reports the 3.1% decline, noting the possible effect of the 4th of July holiday. Small business optimism dipped to 107.2 (P 107.8). Readers have noted that some of the items in the “bad” section are not really that bad. This series remains near record highs, the 7th highest reading in the start of the report in 1975 (Bespoke). 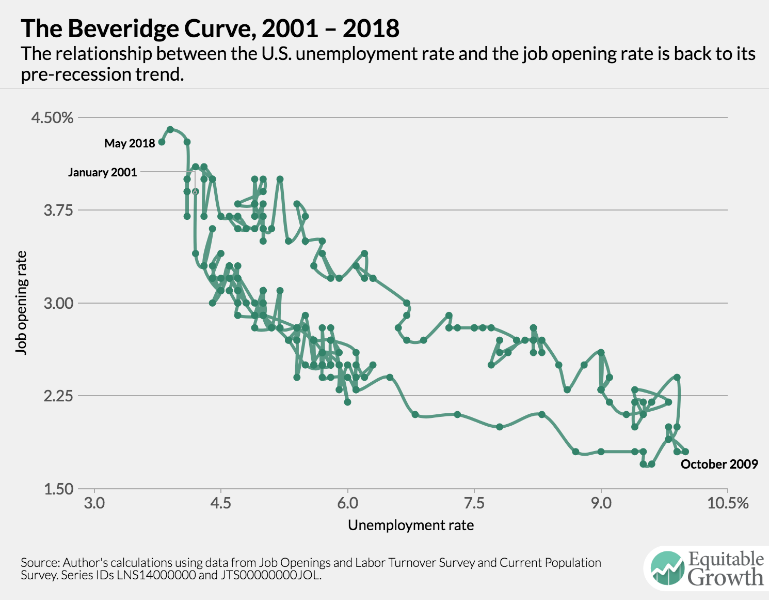 David Templeton (HORAN) looks “under the hood.” See his entire chart pack to get the full story, but a key point is the increase in the percentage of firms expecting a lower economy. 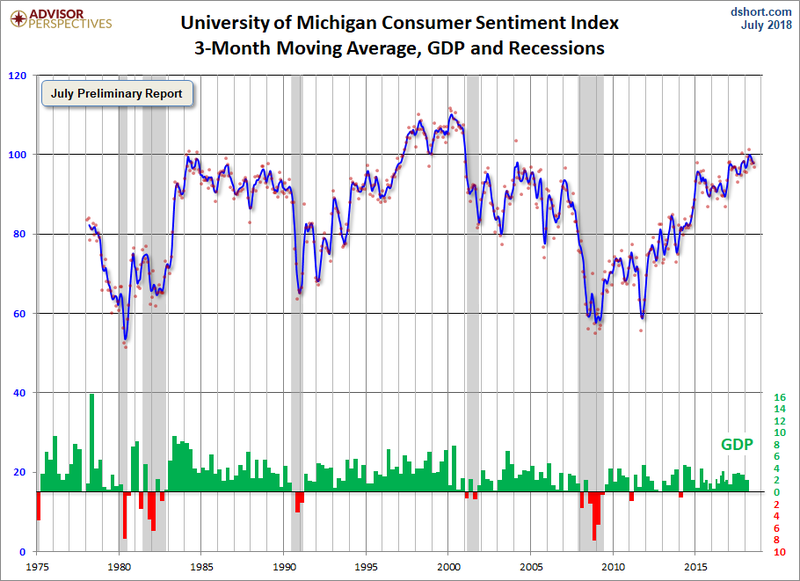 Michigan sentiment registered 97.1 (E 98.1 P 98.2) on the preliminary reading for July. The Jill Mislinski update has the wonderful chart pack we have come to expect. This example has a time series that clearly presents four different variables. In particular, the 3-month moving average highlights the volatility in the series. Sentiment is more positive. David Templeton (HORAN) notes the AAII results along with the NFIB survey (described above). This is a market negative for an indicator generally seen as contrarian. I am canceling the regularly scheduled “ugly” report for this week. Let us instead celebrate some really good news, the rescue of the Thai soccer team. The calendar has several important reports. Housing data, retail sales, industrial production, and business inventories are all important as elements of economic growth. (I personally emphasize the first two). Many swear by the Leading Indicators, and the Philly Fed has been recognized as having some market impact. The economic calendar is only the starting point this week, as I explain below. It is a rags to riches story for the punditry. After weeks of holidays and light news, there is a confluence of important news. I cannot remember a week when so many big events came together at one time. The outcome is completely unpredictable, as it always is. In this case, even the key theme for the week is unguessable. My only safe prediction is that we will have plenty of experts on hand to explain (after the fact) whatever just happened! Let us try to derive some order from potential chaos. Here are the most important events, with a very modest guess about upside and downside. I sincerely hope that my astute readers provide their own insights in the comments! Economic data – probably little effect given the recent market news reactions and competition from other events. Earnings season – there is a lot of optimism already built in. That said, the estimates continue to move higher. Powell testimony – the market seems satisfied with the transition in Fed leadership. Will there be a hint of a change? Faster rate increases? Mueller investigation – becoming even more politicized, if that is possible. 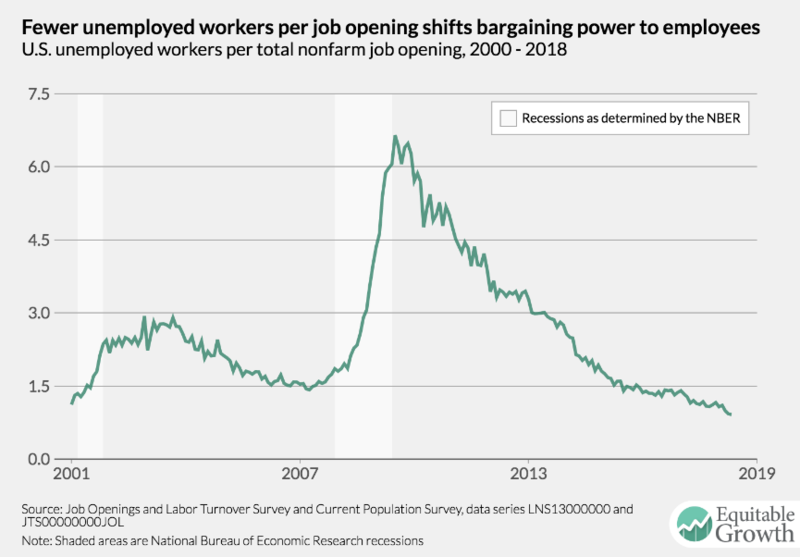 Can it become a threat to policy decision-making? Trump/Putin meeting. Is the hope for improved ties or a stern lecture? Few are expecting upside from this event. Trade rhetoric – new tariffs? A significant sign of progress in negotiations would be a big and positive surprise. More FedSpeak and the beige book. Yet another wild card. At first glance, it seems like mostly downside potential. Feel free to add in the comments any which I have missed. As usual, I have some additional observations and my own guesses in today’s Final Thought. Short-term trading conditions continue at highly favorable levels. Actual volatility remains low. The VIX is coming closer to actual volatility, the closest we have seen in a long time. The C-Score has stabilized in rather benign territory. Equity prices typically fall ahead of the next recession, but the macro indictors highlighted above weaken even earlier and help distinguish a 10% correction from an oncoming bear market. Right now, none of these indicators is hinting at an imminent recession (a recent post on this is here). I continue to find that anyone with a reasonable approach to economics and any sort of analytical track record shares this basic thesis. Despite this, the people getting air time and page views are those whose recession forecasts are of the “kick the can” variety. They are now focused on 2020. How have their two-year forecasts done in the past? Charlie Bilello (Pension Partners) takes up the question of expectations for investment returns over the next seven years. He highlights the forecast from GMO. Then he looks at the GMO forecast from seven years ago. I need to get the Silver Bullet series going again somehow. Check out our weekly Stock Exchange post. We combine links to important posts about trading, themes of current interest, and ideas from our trading models. This week our models had another good week, adding to their long-term outperformance. The question for our trading colleagues was, “What motivates traders to trade?” As always, we highlighted ideas from trading experts as well as some of our own current picks. The ratings from Felix and Oscar this week feature the S&P 400 midcap index. Blue Harbinger is our editor for this information and ringleader for the group discussion. While the series emphasizes trading, investors might want to check it out. The methods reduce risk through diversity and are appropriate for a portion of an IRA allocation. If I had to pick a single most important source for investors to read this week it would be Aswath Damodaran’s instructive and exhaustive analysis of Tesla (NASDAQ:TSLA). Prof. Damodaran is the leading expert on stock valuation. His article is a gold mine for those wanting to learn valuation techniques. Regardless of your interest in this stock, you should carefully read the article. From the company perspective, he describes the challenges, some past mistakes, and the current thesis. He carefully reviews all the relevant data and provides a critique of his own past analyses along with the update. The diagram below tells the story and Prof. Damodaran highlights the four key assumptions that might lead to a value of $412/share. Increase revenues ten-fold over the next decade: Tesla’s current revenues of $12.5 billion will have to increase to $120 billion or more in the next ten years, giving it revenues close to those of BMW today. Assuming an average car price of $60,000, that would translate into 2 million cars sold in year 10, illustrating why the focus on whether Tesla can hit its target of 5,000 cars a week is missing the big picture. Improve operating margins to match the most profitable auto companies: While Tesla scales up its revenues, it will not only have to become profitable (a minimal requirement) but much more so than the typical auto company. In fact, its pre-tax operating margin will climb to 12%, well above the median auto margin of 4.81% or BMW’s 9.89%, powered by brand name and pricing power. Invest more efficiently than the sector: To accomplish its objectives of increasing revenues and ramping up profitability, Tesla will have to reinvest and reinvest efficiently, delivering about $2.25 in revenues for every dollar of capital invested, much higher than than the typical auto firm. To provide perspective, Tesla in year 10 will have to deliver BMW-like revenues ($120 billion) with about a third of BMW’s invested capital; with the estimated sales to capital ratio, Tesla’s invested capital in year 10 will be $64 billion, whereas BMW’s invested capital in 2018 was $185 billion). Navigate its way through debt to safety: Finally, as it moves towards becoming a much larger, more profitable firm, Tesla will also have to meet its commitments on current debt and not add to the mix, at least for the near term. In terms of operating risk, Tesla will have to face a cost of capital of 8.29%, in line with the typical auto firm. Chuck Carnevale analyzes Stanley Black & Decker (NYSE:SWK) considering the dividend, dividend growth, and valuation. With the stock down 20% this year, he sees it as less overvalued. To appreciate the full analysis and to understand more about Chuck’s excellent methods, watch the video as well. Utility stocks? Barron’s suggests a second look. [Jeff – I am not impressed by these choices, all in an over-valued sector]. Lockheed Martin (NYSE:LMT) or Northrup Grumman (NYSE:NOC). Peter F. Way draws upon market maker forecasts to derive a projected trading range. He combines this with commentary on the fundamentals from other sources. Delta Airlines (NYSE:DAL) is “a steal” according to Stone Fox Capital. D.M. Martins Research takes note of some of the negatives but finds them mostly reflected in the current price. Can artificial intelligence replace value investing managers? (Alpha Architect). The research says “yes.” Eventually machines will be able to reason and to learn. This is a theme on my every-growing research and writing agenda. Bill C. Smith has an excellent post for reporters in the investment world. He suggests that they often do not carefully check information asserted by the “expert.” As one who nearly always checks on specific sources, I understand this problem. The post has some ideas, but there are no easy solutions for those on deadline. “Davidson” (via Todd Sullivan), who has a long record of being right on the market and stocks, is announcing a portfolio shift. In my opinion, the policies being implemented by the Administration are likely to have outsized positive effects on the US economy. This has caused a shift in my expectations away from Intl equities favoring US equities. He expects the current period of indecision to resolve toward stronger US returns, partly including a weaker dollar. The Fear and Greed Trader has is typical excellent summary of economic factors and investment conclusions. I especially liked his take on interest rate concerns. Have we seen the last interest rate hike? If your answer is no, then you should agree with me that stocks haven’t seen their highs yet. If you don’t, because it seems convoluted, then you might find this interesting. The fact is that since 1980, the high in equities (NYSE) has come after the last rate hike. Why? Because rising rates indicate an economy that is strong, with expanding growth, incomes, consumption and profits. Under these circumstances, equities should rise. Seeking Alpha Senior Editor Gil Weinreich has added more valuable content to his daily post. While billed as information for financial advisors, it has become popular with a general readership. This week he takes up an important topic, not appreciated by most investors: the advantages of equal-weighted indexes. Most people are unaware of how their passive index investments now have reduced diversity. The argument draws upon a post by Ploutos, discussing five ways to beat a buy-and-hold approach to the market. Abnormal Returns is an important daily source for all of us following investment news His Wednesday Personal Finance section is especially helpful for individual investors. My favorite this week was the Jonathan Clements two-minute financial checkup. It is a good starting point, especially for those early in their investment process. Those farther along probably need a more comprehensive review (which I am still doing on a no-cost, no-obligation basis until I go on vacation at the send of the month). I took the test, and you should try it. Online sports plays. Barron’s notes that it may take years for the story to play out. The punditry will really have to scramble this week. Since we always have newly-minted experts on the topic of the day, many will need crash courses in international relations, Presidential politics, legislative behavior, the Fed (although most already claim expertise there), the analysis of corporate earnings, and recession odds. It should be interesting for those following the news. Here are my starting thoughts, but beware. This is a very wild environment. I’ll rank my conclusions in terms of confidence. Powell testimony. I expect a careful presentation adhering to the modest, data-driven course of rate hikes. Questioners will try to trip him up, but I doubt that any serious changes will emerge. Earnings season. Everything suggests a big increase over last year – 20% or so. The forward guidance last quarter was good, and the tax cut effects are playing out. This may not translate into higher stock prices unless the report is perfect. The market meme emphasizes trade war, strong dollar, and rising costs. Any company that highlights these themes in the outlook will see an instant reaction in the stock price. Home sales and other data. The home story has strong positive potential—eventually—but we may not see it this week. It needs a cocktail of faster local zoning changes and approvals, more construction labor, continued modest levels of interest rates, and a flattening of raw material costs. A liberalized immigration policy and some cooperation with Canada would help. Even without these elements, the demographic demand is strong. The leading indicators should also continue a positive pace. Trade war news. It is difficult to see how it can get any worse in the short term. While I expect adverse effects to show up over time, the rhetorical salvos seem to have peaked. The Trump/Putin meeting. I don’t even have a guess about the actual result. I am confident of only one thing – one person will be enthusiastic about the outcome, and many will have heavy criticism. My favourite of the week? “Because nobody knows what (Theresa) May will do next, the market eased up…” (Ya cannae make it up)! The OldProf news cycle is as follows: Uneventful day, well within normal random fluctuations à Breathless headlines and intra-day explanations à All-knowing evening business news reports without a shadow of doubt à Misleading information for investors. I see it every day, with a handful of exceptions for really big news. Despite the news-laden week ahead, none of it will require your immediate attention – especially not in changing your investments. [This is a crucial time for investment decisions. If you are flying solo, you might want to request my papers on risk or the top pitfalls for individual investors. If you are concerned that you do not have a good risk/reward portfolio, or one suited to your needs, feel free to ask us for an analysis. For any of these just email main at newarc dot com]. The trade war. With the apparently modest market reaction, more of the punditry is concluding that victory is in the cards. Actually, stocks would probably be about 10% higher without the trade concerns. Russian hacking. There is widespread agreement about the attempt to influence US elections. This issue should not be political, but that is what it has become. If citizens do not have complete confidence in the sanctity of their electoral process, the foundation of our republic has crumbled. The economy. This is a growth sweet spot which might last much longer. The misguided aging bull story and trade war fears have made valuations attractive. Finding stock opportunities. Investors who are not chasing the old winners – a losing strategy – can find many attractive cheap stocks.